The Church of Jesus Christ of Latter-day Saints (often inadvertently referred to as the Mormon Church) has scripture in addition to the Bible, The Book of Mormon. The Book of Mormon is a record of the ancient people living in the Americas from about 600 BC to 400 AD. This record was found by Joseph Smith (as directed by an angel) on gold alloy plates. The golden plates are often confused with the brass plates, which while important to the Book of Mormon, are not the same thing. The plates that Joseph Smith received were the golden plates, the official record and history abridgement that was translated into what was published as the Book of Mormon. The brass plates are different: we know about the brass plates from Nephi, one of the first Book of Mormon prophets. The brass plates contain the genealogy of the family that left Jerusalem to sail to the Americas as recorded in the beginning of the Book of Mormon. After fleeing Jerusalem to escape the city’s imminent destruction, Lehi, the head of this family and a prophet of God, asked his sons to go back to Jerusalem to retrieve the brass plates. 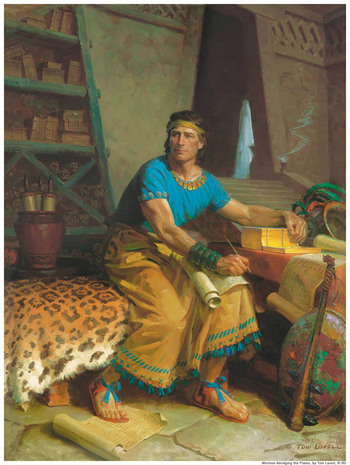 After a few tries, Nephi, the son most prominent in the Book of Mormon, recovered the plates and brought them with the family throughout their voyages. And he beheld that they did contain the five books of Moses, which gave an account of the creation of the world, and also of Adam and Eve, who were our first parents; And also a record of the Jews from the beginning, . . . And also the prophecies of the holy prophets, from the beginning (1 Nephi 5:11-13). The brass plates are important because they were scripture for Book of Mormon prophets. What we know of the content of the brass plates corresponds directly to content published in the Bible. This correlation supports the Book of Mormon story because it shows that Book of Mormon prophets shared scripture and prophets with civilizations recorded in the Bible. While latter-day prophets of The Church of Jesus Christ have never had possession of the brass plates, the brass plates certainly played a big role in the formation of the record that eventually became the Book of Mormon, one of the key books of scripture for The Church of Jesus Christ. This page was last edited on 9 September 2013, at 13:56.